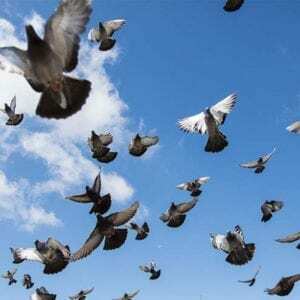 A man has been left devastated after discovering three of his pigeons had been shot dead. He told how he arrived at the site to find three of his Tumbler pigeons were dead after being shot. The 49-year-old, who visits the allotments every day, says each of the birds had a “slug hole in the back of their neck”. Self-employed Sean, who has had pigeons for over a decade, keeps the birds in a pigeon loft. However he has had a number of previous issues – this was the second similar incident at the allotment in the last six months and in 2014 he discovered four of his pigeons and four chickens dead after having their heads pulled off. On Wednesday, Sean said he had reported the latest incident to the police but said they been out to see him and had not phoned. A spokeswoman for Cleveland Police said on Wednesday: “We’ve received the report, it came in yesterday just before 4pm. “It will be recorded as a crime and someone will be in touch with Mr Wardle to take further details for investigation. “Officers assess each call for the threat, risk and harm and have to prioritise incidents where the public are in immediate danger so that resources are used in cases where people are most at risk when the call comes in. 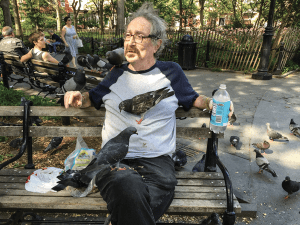 This is the bizarre moment a man feeds his two pet pigeons with seed held in his mouth. In the video, the man is seen sitting on a stone with a pigeon on each shoulder. The man then opens his mouth which is full of grain and lets the birds feed on it together. The birds continue to feed on the grain until their hunger is satisfied. 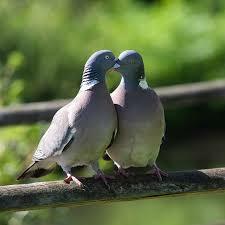 The pet owner said: ”I am quite attached to my birds and I like to feed them from my mouth. 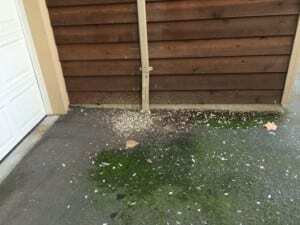 Cllr Yvonne O’Neill told a meeting of the town council: “Pigeon excrement is covering the streets in town and people are also leaving dog faeces. 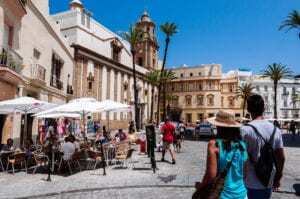 “It’s just atrocious and not a good advert for the town. It’s something I would not want people visiting to see, let alone the locals. It’s not an easy problem to solve but I believe the pigeons and the mess they leave is becoming a public health hazard. She was backed by Cardigan mayor Cllr John Adams-Lewis, who said: “We are working so hard to attract tourists to the town and it’s a terrible sight. When people leave here, you wonder if they would want to come back. “I have spoken to someone in one of the shops and people walk into the shop with the mess on their shoes. A letter was recently sent out by the town council to local businesses and shop owners asking them to clear overflowing guttering to help alleviate the problem. 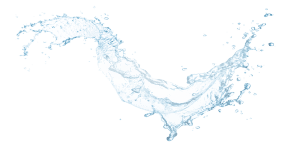 Pesantez pushed the button for water. Surprisingly, the bird wasn’t scared away. Ecstatic about the fountain of water, it started drinking. This isn’t the only time a pigeon has been recorded looking for a drink at the terminal’s water fountains. In 2017, a video posted to Instagram showed two pigeons sitting in a fountain trying to get water. While some commenters thought the act of kindness by Pesantez, AKA “pigeon boye”on Instagram, was “cute,” “incredible” and funny, others also were a little alarmed about the sanitation of the fountain. 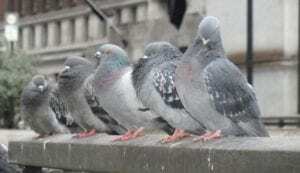 An informal group of animal lovers have taken it upon themselves to help city-dwelling pigeons keep their feet clean. 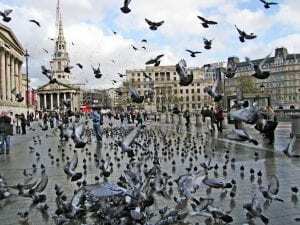 The group, known online as the “San Francisco Pigeons Stringfoot help” find flocks of pigeons and treat them for stringfoot, a condition that can deform the bird’s feet, while also working to break birds’ dependence on humans for food. It normally takes time to build up a talented crop of racing pigeons to taste success, but Latrobe’s Mark Cooney was the star of the Tasmanian circuit in his debut year. Cooney won two Tasmanian Racing Federation races from Beckley Park in Victoria, won the federation loft points, was first and second in the ten dollar ring race out of Tantanoola in South Australia and was the loft point winner for the Northern region of Tasmania. Cooney said he had background with pigeon racing when he was growing up on the North-West and it was that love affair that got him back into the sport. “He actually gave me pigeons when I was eight and fancied them and when I moved to Devonport and I raced three times when I was 17. “I was playing golf with Phil Matthews and he said his brother Chris raced pigeons and a week later he got in touch with me. “He told me to go see Warren Connell (Devonport Flying Club president) and he would give you ten pair. 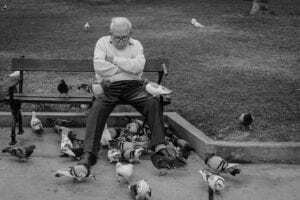 For young people who would love to get into pigeon racing, there are a lot of good people at the clubs who will help you. Following the support Cooney received from the Devonport Flying Club to get started, he now owns over 130 pigeons that he trains to race. Cooney said pigeon racing was actually not an overly expensive sport to get involved in if you speak with a racing club when you want to get started in Tasmania. “For young people who would love to get into pigeon racing, there are a lot of good people at the clubs who will help you. Dozens of birds in New Zealand have been found dead or injured with Christmas decorations tied around them, prompting calls for anyone with information on who is behind the cruel attacks to come forward. The Royal New Zealand Society for the Prevention of Cruelty to Animals(SPCA) said a number of sparrows and pigeons have been reported with “decorative trinkets” tied to them in the capital, Wellington. Some of the animals died of starvation as they were unable to fly and find food, the SPCA said. The charity noted that while there had been similar incidents in the past, there has been a spike in sightings in recent weeks. “Those that do survive and arrive at our centre are always in a very bad state, and are so malnourished and distressed that we have had to humanely euthanise them,” the SPCA’s spokesperson Paige Janssen told the BBC. Janssen said there had been several reported cases of “decorated” birds since 2015 but the number of sightings had increased over the Christmas and New Year period. “We received around 30 calls alone just over this period. They were multiple sightings of a dozen birds that are still mobile and flying around the Kilbirnie area that we are unable to reach,” she said. On Wednesday a property was searched in an attempt to find the so-called Wellington sparrow killer and the local SPCA said it was looking for the suspect behind this “case of cruelty”. Last week it put out an appeal for information. 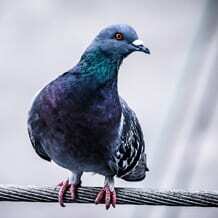 The SPCA general manager for the central region, Ros Alsford, told the New Zealand Herald that decorated pigeons were removed from the property on Wednesday, and brought to its hospital where they were given a check and had the trinkets removed. Six ’emaciated’ pigeons were dumped in a box and abandoned by the side of the road. One of the birds had already starved to death by the time the grim discovery – on Cherry Tree Drive in Hazel Grove, Stockport – was made on Saturday. The other birds were so skinny that their bones were visible. A resident found the pigeons at the side of her driveway and alerted the RSPCA after realising they were not in good health. Inspector Heather Morris was sent to the scene and found the five surviving birds were very unwell. They were emaciated, lame, had pigeon pox and were very dirty. They were taken to the RSPCA’s Stapeley Grange Wildlife Centre where a vet assessed them and decided the kindest thing to do would be to put them to sleep to end their suffering. Inspector Morris said: “It is really unusual to have pigeons abandoned and it was so sad to see them in such a sorry state. “Whoever allowed to them to get like that would have known they were unwell and emaciated – that doesn’t happen overnight. Their bones were visible they were so thin. “I believe they were in this box for 24 to 48 hours and during that time the starving birds were without food and water. She said one bird was ringed but the details were out of date. There was a name on the rings which read “Behrooz”. The cardboard box was also distinctive with the words ‘Private Reserve Fries’ written on the side. Bizarrely, the man explained that he was trying to use the birds as bait to recapture his pet owl, which had escaped. He was caught in a public area of woodland near Wakefield and had his children with him at the time. The air rifle was seized by police and the owner reported for firearms offences. 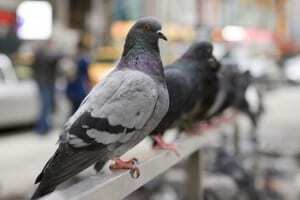 Nuisance pigeons have ruffled a few feathers among diners at restaurants at Chatham Maritime. And now site managers have chosen a humane way of getting rid of the pests – they have brought in a flying squad. Trained falcons have proved successful in deterring the birds at Pier Five where there are a number of al fresco eateries. The most common is the harris hawk, which are natural predators of pigeons and therefore their regular presence scares them away. Chatham Maritime is home to several restaurants and with views across the water, is popular with diners wanting to sit outside and soak up the atmosphere. But the food was also attracting birds looking for scraps. Chatham Maritime Trustees have hired Rentokil Pest Control experts to eradicate the problem. 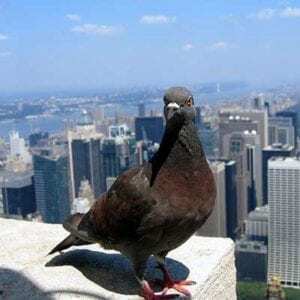 Rentokil’s operations manager Paul Catlin said: “The pigeons are a genuine problem for a number of the traders at Pier Five. “A humane approach was the best way of dealing with them. The pigeons love of food has encouraged them to come into regular human contact, with some brazenly approaching customers around the marina area. Rentokil has hired falconers to carry out the task. Falconer Marc Bushell is a regular visitor with his hawk, Oliver. The birds, which are trained at The Hawking Centre at Doddington, near Sittingbourne, protect landmarks and places of special interest throughout the south, including London. Liam Merrett, a supervisor at Pier Five and Kitchen, said it had proved quite a novelty see a falconer walking along the quayside with a hawk. Mr Merrett said: “We are quite sheltered here and we have patio heaters, so our customers like to eat and drink out even in the winter months. The regular presence of raptors alters the behaviour of pigeons and gulls, who learn to avoid areas where the birds of prey are frequently flown, moving on to nest or roost elsewhere. The bird was wearing a specially made vest decorated with gold and silver rhinestones. It was turned into a shelter, which posted a photo of it and its bedazzled outfit — trying to locate the owner. The other day, a woman in Peoria, Ariz., found an unusual bird in her backyard – not some exotic breed. No, this was just a gray pigeon, but it was dressed to impress. The bird was wearing a specially made vest decorated with gold and silver rhinestones. The woman turned it into a shelter, which posted a photo of the bird and its bedazzled outfit, trying to locate the owner. They say they want the pigeon to get home for the holidays. But based on what it was wearing, maybe the pigeon had somewhere else to go.